Here in Canada it’s Mother’s Day. My daughter and her husband invited us round for a glorious brunch, and there was no way I was going to insist, ‘I can only eat wartime rations’. Still, I might have felt a bit guilty about it had I not come across the following book. It appears that not quite everyone during the war was ‘In it together‘. At least, not if you had money. So today I’m ‘pretending’ I had breakfast at the Savoy. For dinner tonight… bliss. 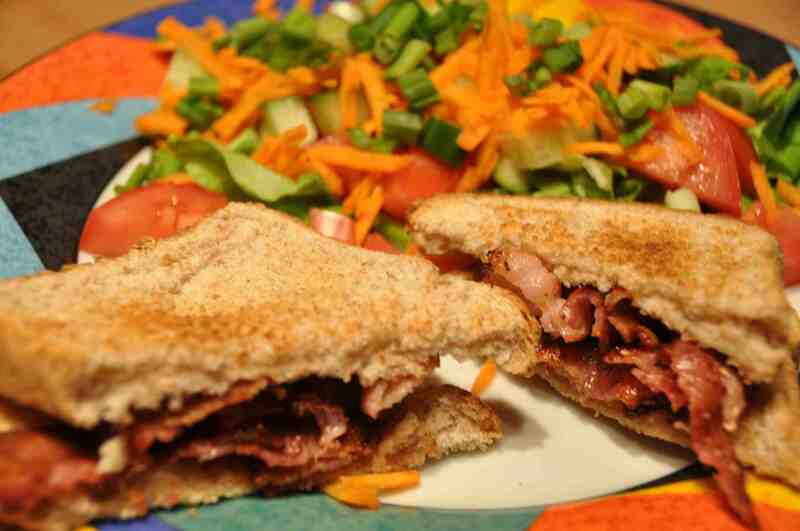 A bacon sandwich, salad and stewed rhubarb. The perfect end to the perfect day. My original plan was to eat wartime rations for only one week, but I’ve decided to go for two as I feel I’m only just getting into the swing of things. And I’ve persuaded my husband to join in – sort of. He’ll be eating lunch out while he’s at work – just as people ate out during the war without it affecting their rations. But if I can add his rations to mine then maybe I’ll have a little more flexibility in my food planning this week. Besides, Anne still has some great memories to relate. In the light of having a ‘luxury’ day, here’s one about the time her big brother brought home such a treat. Known to the family as Alex, his professional name was Percy Huggins. If there are any golf aficionados out there, they might recognise him as The Voice of Scottish Golf from the 50s through the 70s. After Alex had done many, many more than the stipulated number of bombing flights he was transferred to the Azores on anti-submarine patrol. 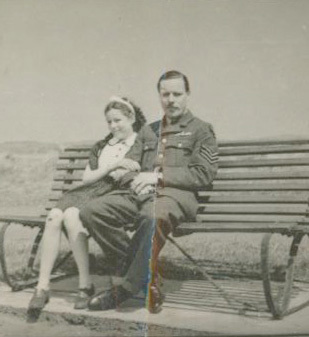 Here there were bananas, and when he came home on leave (after VE Day), managed to bring us a few – Mother made sure their skins were put right on top of the rubbish bins so that when the lid was lifted the dustmen could wonder at them! This entry was posted in Uncategorized and tagged Percy Huggins, Scottish golf, The West End Front, wartime memories, wartime rations. Bookmark the permalink.